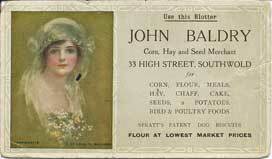 Barbara Lay - Grocer. George dies this year and his widow takes over the business. 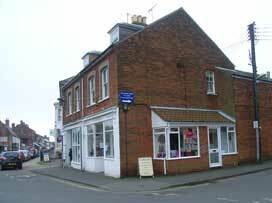 Shortly before her own death in 1897 (GRO), she moves home and business to 33 Station Road known as 'Prospect Place'. Walter James Doy and his son, Spencer Frederick Doy - trading as WJ Doy & Son,Coal and Corn Merchants, acquire the business this year. No 33 becomes the registered address of the combined Doy family business which has historically traded from buildings at 15 Lorne Road. The coal merchant side remains at Lorne Road, managed by Spencer Frederick while Walter James concentrates on the Corn Merchant side. Walter J Doy & Son - Trading as W J Doy and Son. Management of the shop has recently been taken over by one of Walter's five sons, Cyril E Doy (younger brother of Spencer Frederick) Walter having fallen ill. He dies in June this year. 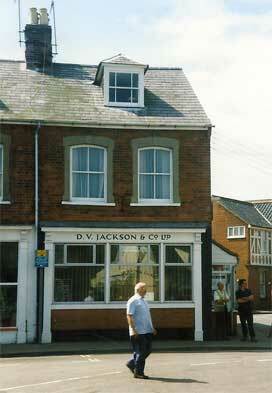 David Jackson - trading as D V Jackson & Co - Investment and Insurance Agents. Vanessa Collen and Clare Adkins open their first clothes boutique 'collen & clare'. 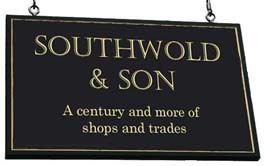 The following year they move the main part of their business to No 25 Market Place, retaining 33 first as a 'sale shop' and later as a children's clothes shop. Promotional blotter from John Baldry. Reproduced courtesy of Cyril Doy. 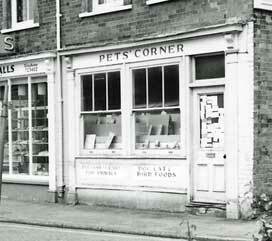 Cyril Doy's pet supplies shop photographed on Saturday 30 June 1979 by David Baker whom we thank for supplying it.